Derry's Conor McCormac, pictured being sent off by match referee Robert Harvey against Dundalk last month, returns to the squad for the visit of Drogheda United tomorrow. 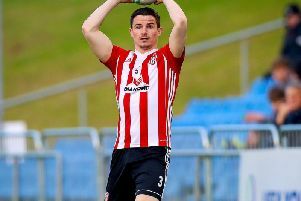 PETER HUTTON has urged his Derry City side to be disciplined and ensure all 11 players remain on the pitch against Drogheda United at Brandywell tomorrow night so they have every chance of striving towards Premier Division safety. Much has been made of the ‘Candy Stripes’ poor discipline after an EIGHTH red card of the season last weekend when Cillian Morrison was given his marching orders against St Pat’s. It’s about building momentum now. Confidence is high and we want to keep that going and go on a run between now and the end of the season and finish as strong as possible. And Hutton’s war of words with match officials in recent weeks reached boiling point following the FAI’s decision to extend Philip Lowry’s suspension to three games following his dismissal against Sligo Rovers. Lowry is one of three key players, along with skipper, Ryan McBride and Cillian Morrison and assistant boss Paul Hegarty, who will sit out tonight’s match against Mark Kinsella’s Drogheda side who arrive on Foyleside determined to drag City back into the relegation mix. Hutton this week called for clarification from the FAI on the role of fourth officials who have been directly responsible for two Derry City sendings off this year. As of last night, the Derry boss was still awaiting a response from the League of Ireland’s governing body but he’s asked his players to avoid playing into the hands of the opposition and to keep their composure in what is a hugely important fixture tomorrow evening. “It’s important we keep disciplined and keep 11 on the pitch and that will help us get results,” warned Hutton. “Some sendings off have been justified, some haven’t been this season. There’s a catalogue of incidents and we could make a film about the decisions which haven’t gone our way this year. Derry’s disciplinary problems have certainly caught up with them ahead of tomorrow’s game with the above mentioned players sitting the game out. Top scorer Mark Timlin is also a major doubt as he struggles with a calf injury while Stephen Dooley faces a late fitness test. However, midfielder Conor McCormack is expected to return to the starting line-up and Hutton is hopeful the club receive international clearance for new signing, Ben McLaughlin in time for the game. Hutton will certainly have to reshuffle his pack and he’s expecting a stern test from the visiting Drogheda side who have been in freefall in recent weeks having gone eight games without a win dating back to June 26th! “I expect a stern test, particularly given they have a new manager on board now in Mark Kinsella,” predicted Hutton. “I’m sure the players will be out to impress him and show him what they can do. They’ve added one or two new faces since we last played them who will be good additions to their squad. “I still suspect there to be a lot of twists and turns this season. Teams will take points off each other between now and the end of the season. “I don’t think winning this game would make us automatically safe. We’re still in a precarious position and we have to build on the positive performances we’ve had of late.